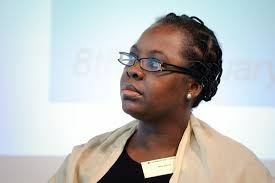 Bisi Silva, the founder and Artistic Director of the Centre for Contemporary Art (CCA) in Lagos died on Tuesday after a protracted battle with cancer. She died at 3:45 p.m in Lagos. She was Joke Silva’s younger sister. She opened CCA in 2007 and later Asiko International Art School in Lagos. After her first degree in Foreign Languages in Paris, she earned her two-year MA in Visual Arts(Curating and Commissioning of contemporary Art) at the Royal College of Art in London. When she moved over to Nigeria, she blossomed in her field, earning the respect of not only major artists but wealthy art collectors too. Bisi curated numerous important exhibitions in Nigeria, Africa and Europe. These exhibitions included ”Democrazy”, Playing with Chance: El Anatsui” and ”J.D. Okhai Ojeikere: Moments of Beauty.” She was in her fifties. In October 2015, she presented a fascinating coffee table book, J.D. OKHAI OJEIKERE, in Lagos. The book is the most comprehensive archive of powerful photographs of over six decades of Ojeikere.